This Editors Pack includes the following The Ordinary products and is the perfect evening skincare routine: 1 X Buffet– Multi-Technology Peptide Serum to fight all signs of ageing. 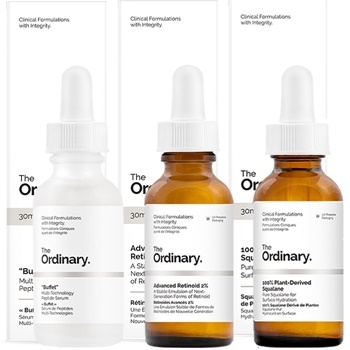 1 X Granactive Retinoid 2% Emulsion (Previously Advanced Retinoid 2%) - a retinoid that fights visible signs of ageing without irritation and delivers an overall improvement in pigmentation, texture and skin clarity. 1 X 100% Plant-Derived Squalane – for hydration, skin nourishing and plump skin. Editors Note: "I swear by this routine, I stick to it and my skin loves me for it! Remember, it's so important to be consistent to see results from your skincare routine – using products occassionally often won’t achieve the the same results." A no-brainer night skincare routine. I'm a total convert to this brand. The value is amazing the results in my combination skin mean that I won't use anything else. Loving this combination of products. It has cut the guess work out of my evening skincare routine. I feel like I am giving my skin all that it needs, overnight (as we all know that is the best time for skin to repair). I have particularly loved the Retinol, no irritation experienced whatsoever and it was absorbed into my skin instantly. These products are the perfect combination of peptides and hydration, for supple, nourished skin in the morning, not to mention that retinol is indeed the best anti-ager out there. Highly recommend it!